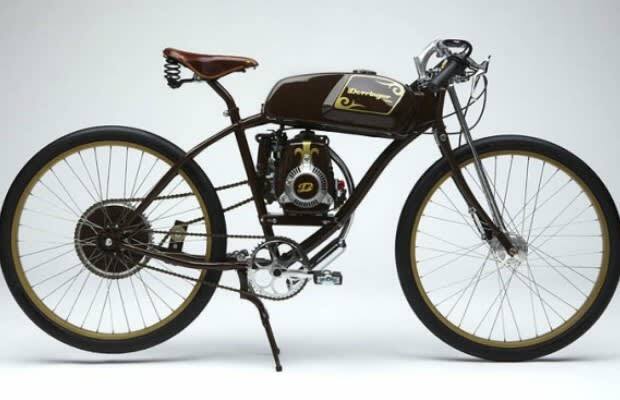 Internationally renowned industrial designer Adrian Van Anz brings a classic &apos;20s-era racing motorcycle style to his Derringer Cycles brand. Sporting a 49cc, four-stroke engine, the bikes will get you about 180 mpg. And they offer the option of a pedal-powered drivetrain system in either single-speed or fixed-gear. The customizable, hand-made motorized bicycles (the term "moped" just doesn&apos;t quite fit the degree of style these represent) include custom paint jobs, Brooks leather accessory and bag options, hammered copper rivets, and carbon-black-free white tires. Starting at about $3,500, Derringer&apos;s line of motorized bikes presents an excellent alternative for anyone looking for something between a bicycle and a motorcycle, but who just too hip to be caught on a moped. If you&apos;re really digging the whole &apos;20s Derringer vibe, check out our feature on the company&apos;s full line of menswear here to get the whole James Dean look done right.